She's Fantastic: Marvel Limited Articulation BLACK WIDOW! Marvel Limited Articulation BLACK WIDOW! Hasbro has really been impressing me with their non-collector lines. The Titans Series and the animated-style basic figures have been great. I've been waiting forever for them to include a female figure in their limited-articulation Marvel line, and it finally happened. I figured the inaugural heroine would be either Gamora or Black Widow, and I was right, Black Widow started popping up on eBay and Instagram in January. These limited articulation figures are found at places like Dollar General, Family Dollar, Walgreens, Big Lots, and the checkout lines at Wal-Mart. They look similar to the main collector lines, but they are slightly smaller and they only have three points of articulation (Neck and Shoulders). Black Widow has been elusive. She is shown on the packaging in the Wal-Mart assortments, but she doesn't actually appear to be included. I drove myself nuts hunting for a week, before resorting to eBay. Black Widow looks amazing. The sculpt is really terrific and she will make a great addition to any collection. This Black Widow design doesn't seem to be based on any comic, cartoon, or movie. The only other time I've seen it was on the Marvel Titan Series figure. It's a shame too because I really like the bold red hourglass, and it's random that it seems to be a Hasbro original design. 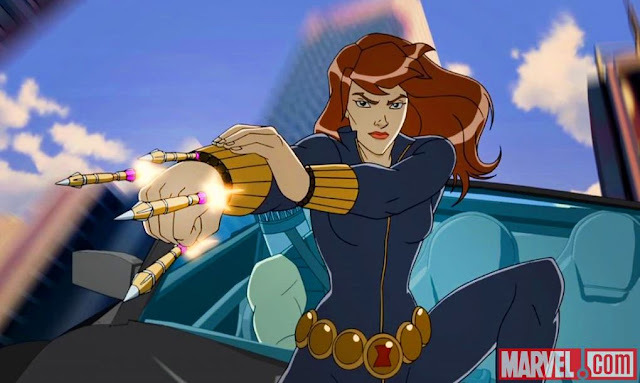 Here is an image of Black widow in Avengers Assemble, one of her more recent animated appearances. Here is this figure next to the evergreen Avengers Black Widow that came out this time last year. I thought this head swap was interesting. NOTE: This is not a straight forward head swap, the ball on the neck of the body is too small and the head fits loosely on it. I have a balled-up piece of tape jammed up on there to make it sit nicely. The reverse head swap won't work without some Dremelling. Here she is with Silk and Jewel. Black Widow's head is essentially the same, but pantographed down a few scales and the hair is slightly simplified. Here she is with the two other limited-articulation Hasbro ladies so far: Strongarm and Rey.